The fishing on Georgetown Lake has been awesome with dry damsel fly patterns. The best time is during the heat of the day. A slight twitch is like ringing the dinner bell for fish in the 16 to 18 inch range. The dry fly fishing on the big rivers around Missoula has been fairly good in the mornings, but seems to slow down quite a bit during the heat of the day. If you are new to the area or just visiting, you may want to try smaller streams. Upper Rock Creek or Fish Creek, West of Missoula. Also, try some very small streams like Mill Creek, by Frenchtown, or some of the smaller streams in the Bitterroot Valley. The shaded canopy of trees really cools you off even on extremely hot days. If you can travel and want to dry fly fish for risers, I would suggest the upper Missouri River by Wolf Creek. There are tons of tricos out. You may want to use a dry trico cluster to try and fool them or tie on something a bit larger. Hopper season is right around the corner. It’s probably about 2 or 3 weeks away. Anyway, pray for rain and cooler temperatures. 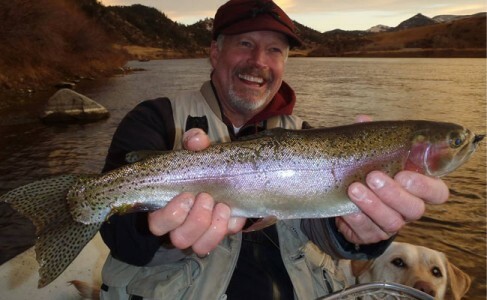 You can contact the Mountain Man at (406) 370-9183 or stop by his website John Perry Fly Fishing.com.